Prop 2 (Rainy Day Budget Stabilization Fund Act) would require greater deposits into the Rainy Day Fund each year and enact further restrictions on suspending or reducing deposits into that fund. In addition, Prop 2 shifts more power to the governor, further tying the hands of the legislative branch in budget decision-making. The state budget Rainy Day Fund, also known as the Budget Stabilization Fund, was created in 2004 and sets aside funds each year during a budget surplus for difficult economic times. Since the recent economic recession, the state has cut over $15 billion in services and programs for California’s most vulnerable seniors, people with disabilities and low-income individuals and families. Though we are recovering financially, we have yet to restore these basic needs and safety-net programs. Prop 2 would obstruct our advocacy efforts to reinvest in critical health and human services. ACLU SoCal has long fought to preserve California’s safety-net programs during hard economic times, and after repeated years of budget cuts since 2008, we remain committed to restoring basic needs programs for the state’s most vulnerable people. Vote NO. Prop 45 (Public Notice Required for Insurance Company Rates Initiative) would require the following: (1) that changes to individual and small group health insurance rates be approved by the California Insurance Commissioner; (2) provide for public notice, disclosure and hearing on health insurance rate changes, and subsequent judicial review; and (3) prohibit health insurers, similar to auto and homeowners insurers, from determining policy eligibility or rates based on lack of prior coverage or credit history. ACLU SoCal strongly advocated for the passage of the federal Affordable Care Act and continues to advocate for its full implementation. Prop 45 would further fulfill our commitment to economic justice. Prop 45 increases transparency and establishes a mechanism for approving rate changes before they are implemented, which will add protections and cost-controls for approximately six million Californians who purchase small group or individual health insurance plans. Vote YES. Prop 46 (Medical Malpractice Lawsuits Cap and Drug Testing of Doctors Initiative) would require physicians to submit to random, suspicionless drug testing. Such testing would pose an unwarranted intrusion into their right to privacy protected by the Fourth Amendment and the California Constitution. Random, suspicionless drug testing fails to deter drug use and is unnecessarily intrusive, particularly given the less-intrusive alternative approach of testing individuals only when there is individualized suspicion of impairment or another particularized reason to do so. Prop 46 also breaks the "single-subject rule" for ballot measures; it improperly addresses three different subjects: (1) raising the damages cap that applies to certain medical malpractice suits; (2) requiring that physicians submit to random drug testing; and (3) mandating that physicians consult a database before prescribing certain medicines. The California Constitution provides that “an initiative measure embracing more than one subject may not be submitted to the electors or have any effect.” This so-called "single-subject rule" is designed to prevent voter confusion and also to prohibit inclusion of a popular provision as a sweetener in a measure that would otherwise be unlikely to pass. 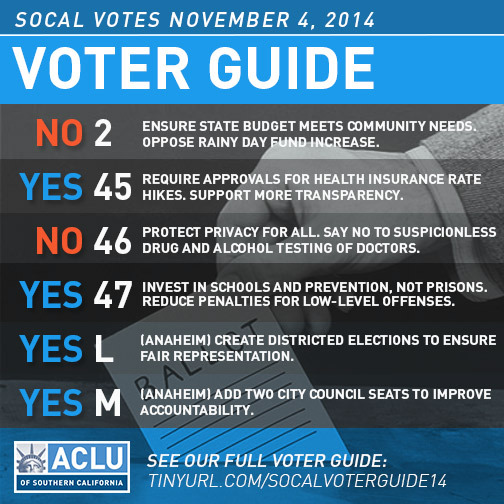 With Prop 46 as drafted, voters may well support some parts of this initiative but oppose other parts of it. Californians should be able to vote their conscience separately on each of these individual provisions. Vote NO. Prop 47 (Safe Neighborhoods and Schools Act of 2014) would reclassify some six of the lowest-level non-violent crimes such as simple drug possession and petty theft, from felonies to misdemeanors. Prop 47 reinvest the more than $1 billion dollars it will save over five years from state corrections into programs proven to stop the cycle of crime, utilize law enforcement resources for the most serious offenses and permanently reduce incarceration. Prop 47 will also enable our state to invest in K-12 education, mental health, drug treatment and crime victim services, and help people with a low-level, non-violent felony conviction become stable and productive community members by removing barriers to employment, housing and assistance programs. For decades, ACLU SoCal has advocated to roll back excessive sentencing laws that separate families and disproportionately impact communities of color and low-income individuals from accessing educational, employment and economic opportunities. Prop 47 would be a monumental first step towards dismantling California’s over-incarceration machine and redirecting precious resources into the education, truancy prevention and mental health and drug treatment programs our communities need to thrive. Vote YES. Measure L would create districts in Anaheim and require that council members live in the district they represent. It would allow residents to elect a council member from their own neighborhood. Measure M would add two seats to the city council. Measures L & M are common sense reforms for the city of Anaheim and, if passed, would create small, manageable city council districts that would allow council members to respond quickly and efficiently to their communities' needs. Anaheim is the largest city in California that does not have districts. Currently, each of the four city council members are responsible for 67,000 people, which is more people per councilmember than in any other city its size in the state of California. Approving Measures L & M will bring local government closer to Anaheim neighborhoods. Vote YES.